I've been using the free, standard edition of Legacy for quite some time now. I can't believe how much your company "gives away." Thanks so much. I recently watched your What's New in Legacy 6.0 video and was thrilled to learn about the new Publishing Center and the Historical Timelines. As a long-time genealogist, I understand the value of timelines and history. You've now combined the two! Then I reviewed your Legacy 6.0 Deluxe Edition Features article, and I can't believe how much more there really is in the Deluxe edition. (You should really make this article more "prominent" on your home page though.) I've been using the Deluxe edition now for about a week and am so happy to see new features that were hidden before. Thanks so much! Alice - love your enthusiasm! Thanks for the note. We'll let our users know about the Deluxe Edition features article in an upcoming news article. She's right. The Deluxe edition now has 92 features that are not included in the Standard edition. For a complete list, visit http://legacyfamilytree.com/DeluxeEdition.asp. "If you can remember your ancestor's marriage date but not your own, you are probably an addicted genealogist. " Fortunately, Legacy Family Tree can help. Using the new Marriage Reminders feature, you'll never miss your anniversary again. Click here for the complete article. For a limited time only, Relative Genetics is offering a Y DNA 26--Family Line Verifier™ test to active Boy Scouts of America members free of charge with participation in the Sorenson Molecular Genealogy Foundation (SMGF), or at a discounted price for those who do not wish to participate. New in Legacy 6, Legacy lets you record the results of various DNA marker tests available to anyone. Comparing the test results of different individuals can often indicate a common ancestor within a predicted number of generations. To record the results, or just to see what it looks like, in a person's Individual's Information screen, click on the DNA button. There are several different DNA tests from which to choose. You can also click on the More Information button to learn more about how DNA testing can actually help your brick-wall research. The following article is from DearMYRTLE's mailing list and is copyright 2006 by DearMYRTLE. It is re-published here with the permission of the author. Information about the mailing list is available at www.dearmyrtle.com. A new genealogy blog has surfaced. After publishing their Ancestry Daily News every day for eight years, Ancestry is moving to the latest method of communication - blogging. What I want is to find all the people in my database who lived in a certain location along with name, birth, place, death and place. How do I do that? Click on the View menu. Click on Master Lists. Click on Location. This opens the Master Location List, which is a list of all locations that have been entered into your family file. Locate the desired location in the list, and click once on it. It will now be highlighted. Finally, click on the Show List button on the right. Instead of printing the list from this screen, TAG everyone in the list. To do this, click on the Tag Everyone in List button. However, be sure to first follow the two rules of tagging as explained in Legacy's Tagging and Searching Made Easy video. If these rules are not followed, you could have a "tagging nightmare." Once everyone in the list is tagged, click Close, and Close. Open the Name List by clicking on its button in the top left. Click on the Search button. Click on Show all Tagged. Then select the tag number you selected in step 1. The resulting list is the same list of individuals you viewed earlier. Click on the Print button at the bottom. Select the fields that you want to include in the report. On these screens, you can give the report a title, adjust the column widths, and customize the report in a variety of ways. When you're ready, either Preview or Print the list. You have just created a custom report and you're ready to get back to the actual research. The list we just created contains a list of individuals who lived in a certain location. However, the list includes all time spans. It was not limited to just those who lived in Minneapolis in the 1870s. You can further filter the list to contain just those individuals who match certain conditions such as age, gender, living status, etc. Legacy's Tagging and Searching Made Easy video covers all of these situations. Preview the video by clicking on the Preview button below. Even if you have been using Legacy 6 for a while, the video may have new insights or offer suggestions on how to use these features. Best of all, the video is free! 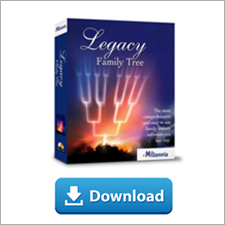 Watch the video at http://www.legacyfamilytree.com/Videos.asp. Just click on the View Now button next to the What's New in Legacy 6.0 title. This database is an index to the passenger lists of ships arriving from foreign ports at the port of Philadelphia, Pennsylvania from 1800-1945. In addition, the names found in the index are linked to actual images of the passenger lists, copied from the National Archives and Records Administration (NARA) microfilm M425, rolls 1-108 and microfilm T840, rolls 1-181. Information contained in the index includes given name, surname, age, gender, ethnicity, nationality or last country of permanent residence, destination, arrival date, port of arrival, port of departure, ship name, and microfilm roll and page number. Other listed information may include the name of a friend or relative whom the individual was going to join or a place of nativity. Many of these items may be used to search the index in the search template above. It is important to note that the port of departure listed on these passenger lists is not always the original port of departure for these individuals. A ship could make several voyages throughout the year, making several stops along way. Oft times the port of departure found on these lists is the most recent port the ship was located at prior to arriving at the port of Philadelphia. Therefore, if your ancestors immigrated to the United States from Germany, they could be found on a passenger list coming from Liverpool, England (if, in this case, the ship left from Bremen, Germany, then continued on to Liverpool, England, before arriving in Philadelphia). The microcopies of the passenger lists found at NARA are arranged chronologically by arrival date of vessel. If you do not wish to search this database using the search template, the images may be browsed following the chronological arrangement. To browse the images first select the "Year" in which you would like to search, followed by the "Month," and finally the "Ship Name..
To search the indexes, click here. The following article is from Eastman's Online Genealogy Newsletter and is copyright 2005 by Richard W. Eastman. It is re-published here with the permission of the author. Information about the newsletter is available at http://www.eogn.com. Genealogy newcomers often trip over the "three brothers" story. It has been repeated thousands of times. I have yet to see one instance in which it is accurate. There were three brothers who immigrated to America. One went north, one went south, and one headed west, never to be heard from again. It is an interesting story, and you might almost believe it. After all, how else can you explain the fact that the same surname pops up in so many places? What fascinates me is that there are always three brothers, never two or four or five or six. And didn't they have any sisters? Why did they go in three different directions? Couldn't two of them go someplace together while the third struck out on his own? Why does each one take a different trip? An examination of thousands of immigration and naturalization records shows that brothers usually remained close-knit and usually resided near each other after immigration. The "three brothers" myth apparently was invented and repeated by lazy genealogists who could not be bothered to find the truth. It is a poor excuse for rationalizing why the same surname appears in multiple locations. When searching for surnames in immigration records, you normally will find more than one immigrant of the name. In many cases, each immigrant did not know the others and moved to wherever he pleased. Later genealogists tried to justify the appearance of one surname in multiple locations and assumed something that is not documented in any records. Be wary of the three brothers myth. You always want to confirm such claims to establish that indeed there were three brothers instead of three unrelated men with the same last name. Yes, someplace in history there probably were three brothers somewhere who split up and went separate ways. But 99.9% of the "three brothers" stories you will hear are fictitious. Before you accept the "three brothers" story in your family tree, do yourself a favor: find documentation that proves the names of their parents. Speaking of genealogy myths, in a future newsletter I will write about Cherokee princesses. SALT LAKE CITY— FamilySearch™ announced today [10 Mar 2006] the release of a new research product that will help those with Mexican heritage to succeed in their quest to learn more about their ancestors. The research guide, Finding Records of Your Ancestors, Mexico, features easy-to-follow, step-by-step instructions, colorful graphics and tear-out worksheets. A free copy can be viewed or downloaded below. Finding Records of Your Ancestors, Mexico, 1859 to Present is the newest addition to a series of popular publications. The guide simplifies the research process for users and clearly explains various genealogical records of interest. It is designed for those who have already gathered some family history information about their Mexican ancestors and are ready to search public and private records. 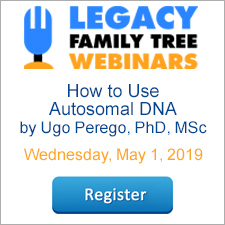 Users will find simple instructions, examples, and removable pedigree and family group worksheets to help them capture what they already know about their families. To further aid users, the guide is also available in Spanish.